Description: Yasukuni Terashima is a well-known, iconoclastic jazz critic and avid audiophile who has published numerous books on jazz and audio in Japan. At age 70 he launched his own label, Terashima Records, and began releasing jazz CDs and LPs that reflects his ideals for jazz music and how records should sound. 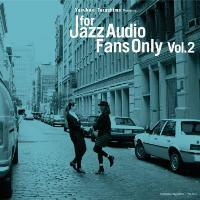 For Jazz Audio Fans Only Vol. 2 is a follow-up to the hugely successful Volume 1 (which sold out very quickly) and a fabulous and eclectic compilation of recent jazz recordings that impressed Terashima with their musical quality and excellent sound. You may not know most of the performers, but they are first-rate, contemporary musicians from Europe, America and Japan. The selection reflects what serious jazz fans in Japan are listening to these days, and is a testament to the breadth and depth of Japanese jazz market. Sonically, these recordings (mostly piano trios with a vocal number and two featuring trombone) are amazizng. They are chosen for details, resolution, natural tonality and dynamics, and represent the very best of modern jazz recording. This limited-edition CD is highly recommended to jazz fans and audiophiles! Compilation produced by Yasukuni Terashima. Mastering engineer: Ichiro Tanaka. Also available: 180g 2LP vinyl edition.